On this flyer im going to teach you guys about my Long Phone Charger. 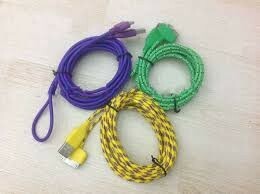 In order to make a long phone charger you will need alot of materials. In order to make this it is an all around cost of 30.00. In order to does this you need the following: Phone cord, a block. It doesnt take that long to make yourself one. This picture shows what my invention will look like. Also it shows some of what i will need to make. I make about 100 a month. Also if you were wondering where i make them, i have a factory name John Phone inc. Here we make all of the phone chargers.